The laughter begins as we enter the tiny theatre and are told that there was a fire in the building last night, there may be a slight whiff of smoke and you know, not to sue them if you start to feel unwell. Everyone was told this upon entering and the laughs lasted throughout the show. The acclaimed musical comedy by Paul Boyd features three desperate women who earn their living as shopkeepers in a place called Mammary Lane, in Little Happening, but they feel trapped. Their love lifes and jobs make them feel unsatisfied and all in all, life could been better, but their humour shines throughout. They are down on their luck, but not down on their spirit. Someone arrives in their little town: Molly Wobbly, was this what the ladies needed? A half-joker, half rocky-horror type man of mystery appears (both in looks and demeanour) named Ithanku and their journeys begin to change, probably for the better. Ithanku gives a splendid performance, which is much enjoyed. Molly Wobbly’s strength lies in their supremely talented cast, who have been nominated for several high profile awards as individuals. The show also features Spike Milligan’s daughter – Jane Milligan. 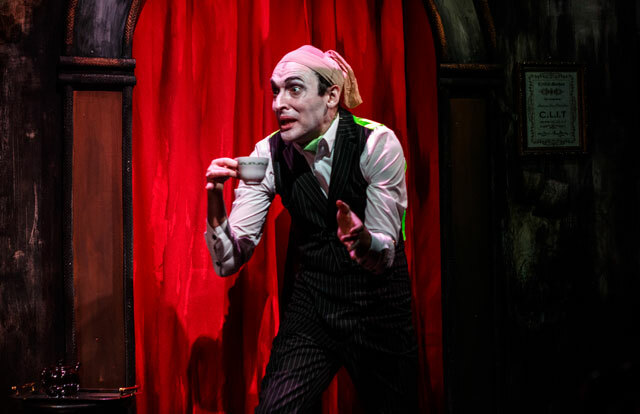 Russell Morton as Ithanku is an original cast member of Molly Wobbly. Such is his character performance, that he actually comes across as almost a cartoon character, almost unbelievable to be an actual real life human being, who delivers a sublime performance throughout and we loved the way in which he contoured his body as he moved around. Each character have their turn to show their talents off and each one brings such energy and comedic gloss to the show. The singing in the show is truly great and the acting abilities of the cast really makes the production come alive. There seems to be a very British style campness about the show. The silly feeling you get when you see those end of the pier and tongue-in-cheek postcards at British seaside towns, seems to permeate throughout each scene. It seems that all was missing was a few endless fart jokes. Pillows, baps, fun bags, jugs – you name it, this show has an array of names for breasts, which resulted in an enormous amount of giggling from the men in the room, who were often guffawing like naughty schoolchildren. There is even a song to accompany a scene which features all these fun and playful names, but for the females watching, we felt that it got a bit much to keep seeing and hearing this, albeit it was done in a very slapstick style way. The show is currently shown in the small downstairs stage at the Leicester Square theatre. It’s such a small venue for a show with such energy and movement. We think it would work much better in a larger space, where everyone had a clear view of the stage and the written words which appear on the screened curtain. It seems such a shame to cram such a talented cast in to such a small area, with limited space for movement. The show is very fun and light hearted. We’re not entirely sure what it was all about initially, but we were too busy laughing to take it all in so seriously. The men in the audience certainly seem to enjoy the show more so than the women, probably due to the scantily clad women in the show, which kept the huge grins on their faces! The show is like a night out with your GBF. It almost feels a bit rude not to turn up in a glittery cowboy hat and feather boas. We had a lot of fun watching this little bonkers show, with an awesome cast. You should go and see this show if you need a pick-me up and enjoy very silly humour.